I live in upstate upstate NY... Yea I am sure I will miss my KLR on occasion, just as I miss my V-strom 1k on occasion. You also bring up a very good point that presented itself to me once again while riding my K-pipe to work and that's the stupid factor. Had a sport bike pass me on a stretch (double solid) but I have him plenty of room let him head into the twistys at his own pace... I quickly caught up to him in the tight turns he had come up behind a car, of which was still going at least 10mph over the posted speed limit when he passed it in a turn on a double solid. Maybe he didn't like a moped looking thing behind him, or maybe he was in a hurry... Regardless It didn't even cross my mind to follow. I was happy at the speed behind the car and not going to get smoked by a truck coming the opposite direction. Yea we will have a full stable by next summer. One thing NY is not to bad about is bike reg; it costs less then $20 a year per bike. Insurance cost $50 for each bike, per year, with full coverage with almost no deductible. We also have a few snowmobiles and ATVs, they are also $50 each, which I don't consider to be to bad this day and age. At a quick glance they appear to be tubeless. Just clocked over 100 miles on it today, took the long way to work and figured I would keep sharing thoughts and impressions as they pop into my head. The seat is really narrow. Its ok for a while but starts to get uncomfortable after about an hour on it. I think I want taller and a touch wider handlebars on it... Though I will probably at least ride it the rest of the year the way it is see if I get used to it. The bars them selves look pretty tall so it will probably be best to go to a dealer and actually compare them. I like lock on grips but will need to figure out which model cam will work for the Kpipe. Overall the brakes are impressive. I know I read some reviews that said they were less then stellar, but I am really impressed. Front disk and drum rear does the job better than to be expected. They would easily suffice even for a 250cc in the bike. While they aren't quite true sport bike performance, they are easily perform better then any of my past dual sports brakes. So far I have only experienced a bit of glair/ and reflection from the dash in really bright sunlight and only at one perfect angle. Other then that I think it fits the bike perfectly. Still getting used to the bit more cramped seating position compared to my KLR, but its no worse then other sport bikes I have ridden. Its easy enough to stretch out on the passenger seat area once in awhile. The engine is getting stronger each time I ride it. Still trying to be nice and follow break in procedures but I did give it a few more RPM and test top speed once I passed 100 miles on the OD. I have also started using a few more RPM in each gear now that I have over 100 on it. Still pleasantly surprised what this little guy can do. I would think it will get better after break in. Not a huge concern as anything in the 70mpg area is perfectly fine in my book. MBlue and klaviator like this. Any one have suggestions on which way to look for some type of seat cushion or pad? A few brief internet searches don't turn up much... Not really interested in spending $100+ on a seat pad, I think I will break out the sewing machine and foam, make one myself before paying that much! Great rates in NY! Surprisingly so! In IL, plates are over $50, and insurance is over $200. Cars are about double that. Nice write of the K-Pipe. I would remove that K-Pipe logo from the bike if it was mine. 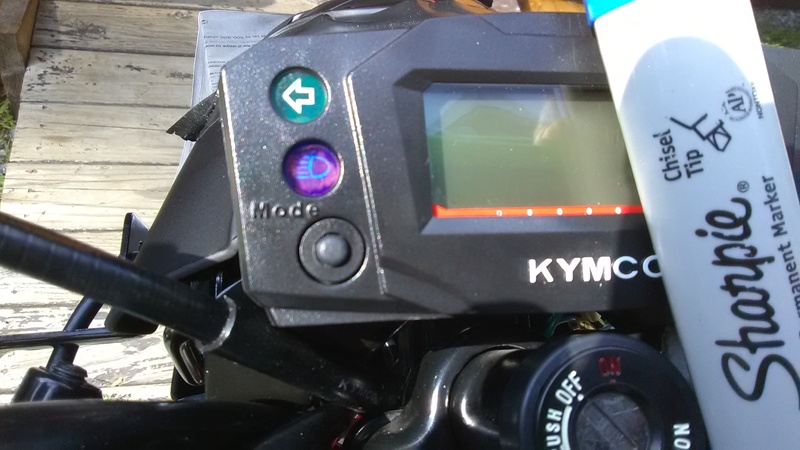 Funny Kymco doesn't say tubeless in their specs. Tubeless is a big plus IMHO. Out of my four bikes, the Dong Fang DF250RTB is the only one that has tubeless tires. I have two Chinese Honda 125cc clones and both have good performance. thederrick106 and Charleston like this. I'm 6' 4", it still looks almost as ridiculous as a Grom under me. For the short ride I took it on it was competent, but it was the old goofy shift pattern. I may have to give it another try before I choose one of the eighth of a liter bikes. I’m on a tablet that hates posting pictures. Sorry for the external link. I make no apologies for the ATGATT, I was actually there for the Cabo 200. 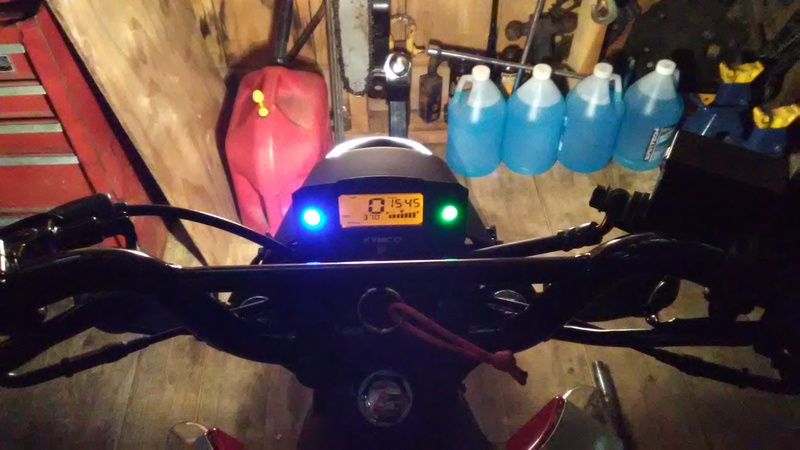 When riding in the dark the blue high beam indicator light is almost to bright... The top of the high beam light it self reflects back a bit, when riding in the dark. I think I am going to tape off about a 1/4~1/2" of the top of the light and paint it flat black. Low beam works excellent, no issues there. Gas gauge seems pretty accurate. 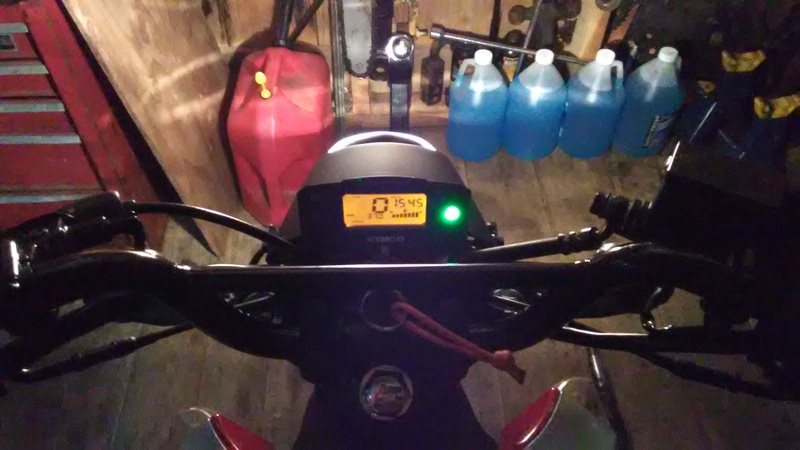 It shows one bar left at E and starts blinking around 60~70 miles on the trip... After that the bars disappear and the gas symbol starts blinking... Not much left after that It took all of a gallon when the "gas light" was blinking. 100 miles would be pushing it the way I ride. Motor is getting stronger with continued break in... Almost to 250 miles on the OD. I started pushing it a bit harder once I clocked 100 miles, and even harder at 200. Down hill top speed with a bit of a tuck: 70MPH per the speedo, which according to all reports reads a bit optimistic, as do all bikes in this class but I would put it at a solid 65mph. I will verify with a GPS at sometime. Still not trying to push it to-to hard but I giver her all she 'gots on occasion now. It will pull 4th gear on easy to average inclines and go 45~50MPH. No problem going 55MPH on flat, but you do start to get some vibrations 55 and above. Its happy at 50MPH. The seat is starting to break in a little more, but it still feels narrow. I need to come up with some type of pad/ cushion if I want to be comfortable for more than an hour on it. Idle at stop will get a bit wonky at times, which is exactly what the dealer advised... Said it will idle up and down until its broke in. Once I get a few more hundred miles on it I will adjust in myself if necessary. 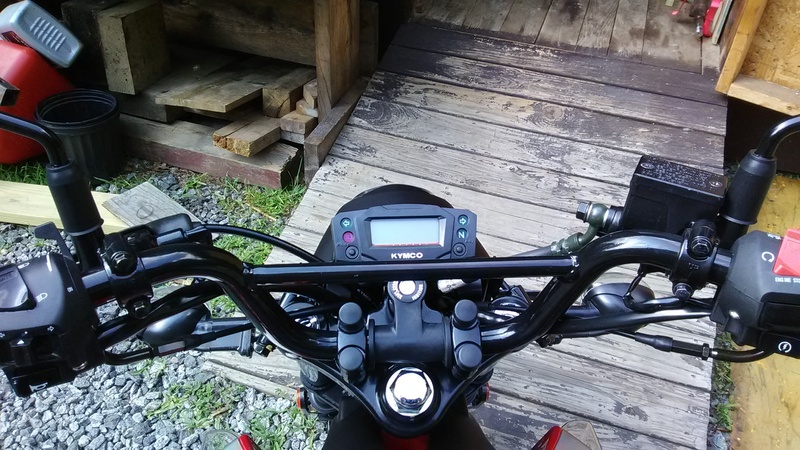 I am warming up to the handlebars, but still think it would look sharp with some aluminum ones on there. After looking at it a bit closer I don't even think a High ATV bend would give me much additional in height. Dual sport tires will defiantly be in order next year. Does anyone know if you can use tube type tires without a tube, on a tubeless rim? Most dual sport tires in the K-pipes size range are all for use with tubes? I don't want to use a tube if I don't need to. Makes field repairs and punctures much easier to fix on the fly with the use of a plug... New tire when you get home, if necessary. Pic posted for ya... So with that said what do you look like on a grom???!!! tankshooter and simbaboy like this. Wow! I did not know we had a K Pipe thread. These are interesting rides I have had my eyes on for a while. Keep the write ups coming. 76MPG -going easy on it. Motor feels like its breaking in a bit. Feels like it has a bit more lower RPM grunt. Other reviews referred to the transmission as having no feedback, or not being able to tell you shifted, I don't agree with that assessment. Of course I have never run high end bikes, and driven a huge variety of ATVs, dirt bikes, dual sports, and other random motorcycles. It feels a bit "clunky" with some throw, but you can tell when you shift to another gear. The display also has a gear indicator on it. The controls are pretty decent, I think I still might want a bit taller handle bars. I may play around with that over the winter. Seat is breaking in a bit, and I am getting used to it, but it is pretty narrow. I might see how much another seat base costs and try making my own for it, or have one made. I really like, and enjoy riding it, but a bit more seat would make it that much more enjoyable. Wife took it for a ride today. She loved it. I road my Ruckus and at 40MPH the K-pipe told her she was going 45. It defiantly reads 3~5mph high depending on speed. Took it out on a quick highway run today for the first time! Had to get around a busy tourist village with backed up traffic and to many lights. Hit the down hill two lane ramp and gave her all she had, tucked, passed a minivan and continued onto the highway. Speedo read 70+ but I didn't pay to much attention to that, as I wanted to merge as gracefully as possible, and couldn't afford to scrub any speed. The stretch of highway I ran between exits consisted of a downhill on ramp, flat level for a mile or two, then it starts to climb back up to the next exit. The K-pipe held 60 on the flat, then started to drop, as the grade inclined. I got of the exit at about 50MPH. As long as your just running a quick exit, that doesn't include and significant hills, and you stay in the slow lane its do able. With that said its NOT a highways bike, but doesn't pretend to be. Its a 125 four stroke. My wife and I are planning cross country fly, buy, and ride trip next year. We have both decided that the K-pipe is not a good choice for the trip. Leaning towards Kymco Super8X 150 scooters. Did the first oil change just over 300 miles. Manual calls for a valve check but I don't have the sepcs, so I will probably just wait till 1K, do that and change the oil again. I couldn't find where the "oil screen" was located on this thing, and google searches camp up empty handed. I didn't feel like ripping things apart in experimental mode so I figured I would just do that, with the valves at 1K. If anyone knows that info please post up. I did a couple other things that I felt were needed. 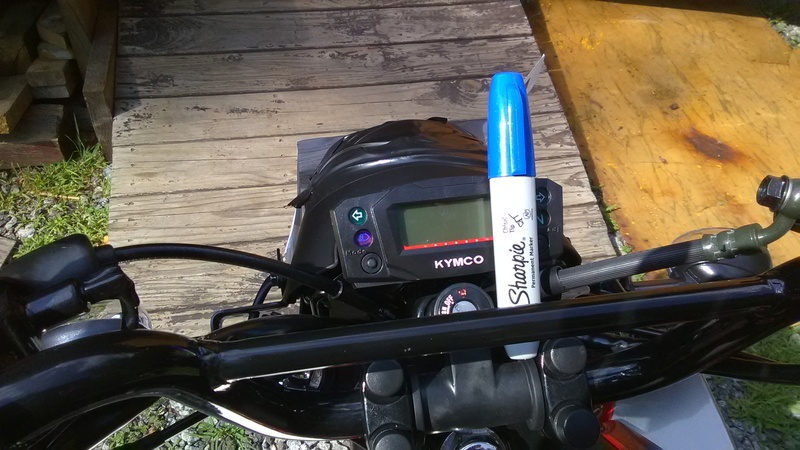 I shaded the blue high beam light with a blue permanent marker, in hopes to dim it a bit at night. 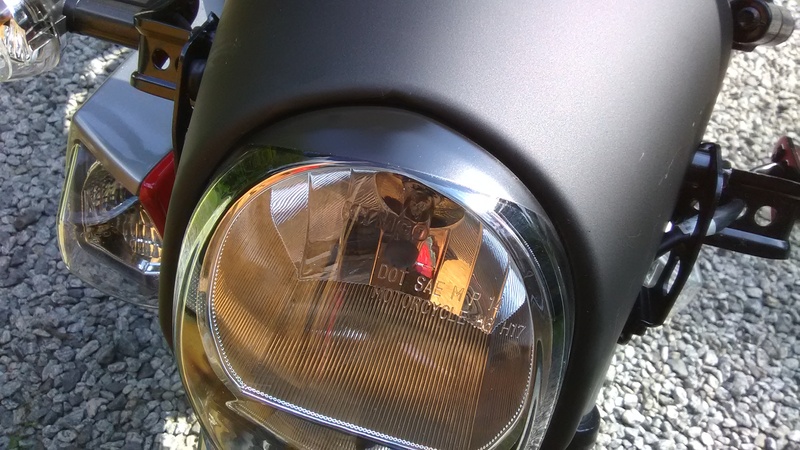 Also wanted to black out the top of the headlight that caused a bit of reflection when riding with the high beam at night. I probably could have covered a little more, but didn't want to go to much to start with. If it needs a bit more coverage, it will only take me a few minutes to tape off and paint a bit more. Plus I didn't want it to look like a mess. If I didn't point it out to most people I doubt anyone would know. Put a piece of electrical tape over the high beam light and be done with it. They come off without leaving tough residue. 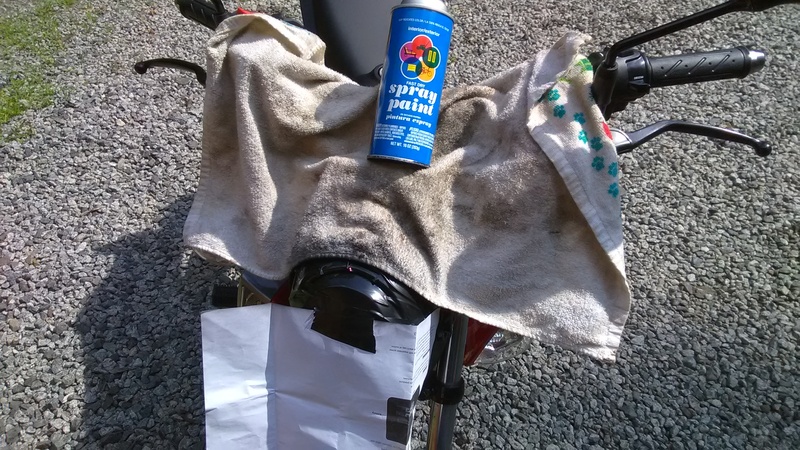 It easily cleans up with a bit of Goo Gone. I don't know why they have to make those high beam lights so blinding to the RIDER. It looks like it has those tacked-on stalk turn signals on the front, to comply with DOT, but there are built-in lights where they probably had the turn signals in Taiwan that would make the design cleaner. Did you consider taking off the stalks and wiring the built in ones as turn signals? So does it have a manual clutch and a standard motorcycle shift pattern? Here in AZ it is not a good idea to mess with turn signals. They have to be DOT approved, and a certain distance apart. 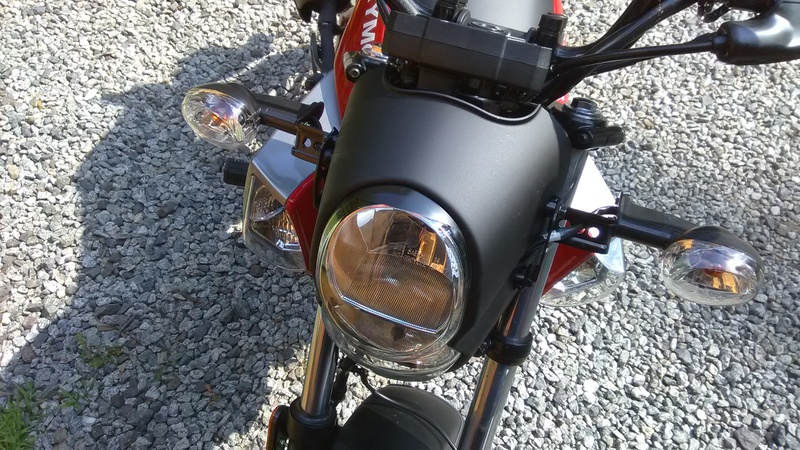 Cops use non DOT turn signals as a reason for stopping sport bike riders, because most of them have replaced them with flush mounts. While that is only a fix it ticket, if you actually make a turn using them, then you get a ticket for making a turn without signaling, since the aftermarket flush mount signals are not legal. That is one law I really don't have a problem with. I want big signals sticking way out there, because I want them to be seen. I believe visibility is the best way to keep from getting run over. thederrick106 and Smaug1 like this. It does not have a standard motorcycle shift pattern. N is on the bottom instead of between 1 and 2. N-1-2-3-4. It has a standard shifter, not a rocker like it came out with originally last year, or like the Honda cubs have. It has an internal automatic clutch, but also a normal hand clutch. You don't need to use the manual clutch at stops, but you can, and you wont notice that it has an automatic clutch. You can ride it just like a normal clutched bike without issue, it just doesn't stall. I use the clutch between gears, as suggested by the dealer. You could skip the manual clutch between gears as long as you let up enough on the throttle I am sure. Stock signal lights are fine by me, not something I really care about, our pay much attention to. 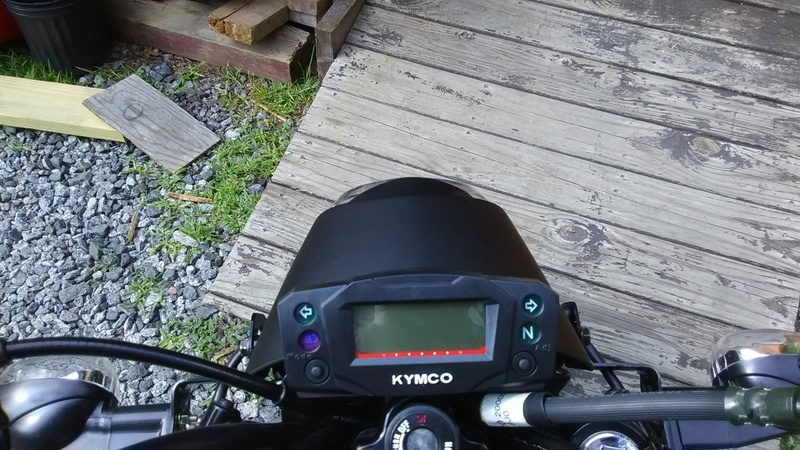 The only time I replaced stock signal lights was on my old KLR because when I bought it, one was a miss match, the others were droopy. I picked up the cheapest clean looking set of signal lights off Amazon and stuck them on there.